Gorgeous lakefront, pool home in Boca Landings which is located within an excellent school zone! Step inside and enjoy spacious living areas along with an inviting kitchen which boasts granite counters, wood cabinetry, stainless steel appliances and opens to a lovely family room. All of the bedrooms are spacious as well. Outside you can enjoy a beautiful patio or relax in the serene pool. Boca Landings is a meticulously maintained community which offers its residents many resort style amenities and is located just minutes from fine shopping & dinning, I-95, the Turnpike and much more! Lot Size: 0.21 Acres / 9293 Sq. Ft. Directions:Yamato Road west Cross over Lyons Rd First right onto Lakeridge Blvd Follow around to 2nd Lake Serena Drive, turn right. Follow to 2nd right. Turn onto Enchanted Pt. Lane. 3rd house on the right. SchoolsClick map icons below to view information for schools near 9730 Enchanted Pointe Lane Boca Raton, FL 33496. 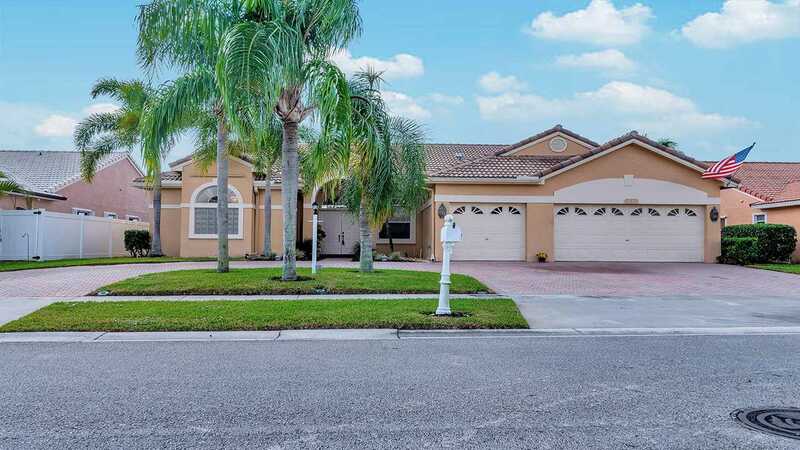 MLS # RX-10486324: This property at 9730 Enchanted Pointe Lane, Boca Raton, FL 33496 is located in the Boca Landings North subdivision and is listed for $470,000. MLS # RX-10486324 has been on the market for 138 days.